The other night Ryan and I were talking about the meals we used to make when we lived on our own for the first time… You know, aside from frozen pizzas, peanut butter and jelly sandwiches, Lean Pockets (I loved those things!) and boxed macaroni and cheese. We chatted about the meals we made when we actually decided to try a little bit in the kitchen for the first time. Ryan instantly thought of red beans and rice with chicken. He’d prepare one of those big bags of red beans and rice, cook up a pound of chicken and dig in! I was all about quesadillas with black beans, onions and chicken. Heck yes! The recipe I’m sharing with you guys today is inspired by my old school favorite but revamped a bit so it’s more filling. 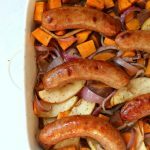 My beloved chicken sausage is still center stage in this dish, but it’s paired with sweet potatoes, thinly sliced apples and red onions for a sweet and savory dinner that’s easy to make and very satisfying. 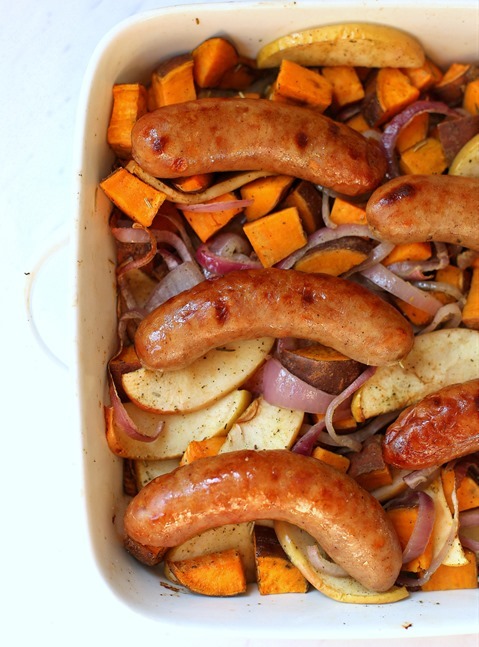 With the exception of a giving the chicken sausage and veggie/apple mix a quick flip halfway through cooking, it’s a set-it-and-forget-it meal you can let do its thang in the oven while you prep breakfast for the next day, straighten up around the kitchen or check something small off your to-do list. There’s no hovering over a pan on the stovetop with this recipe! 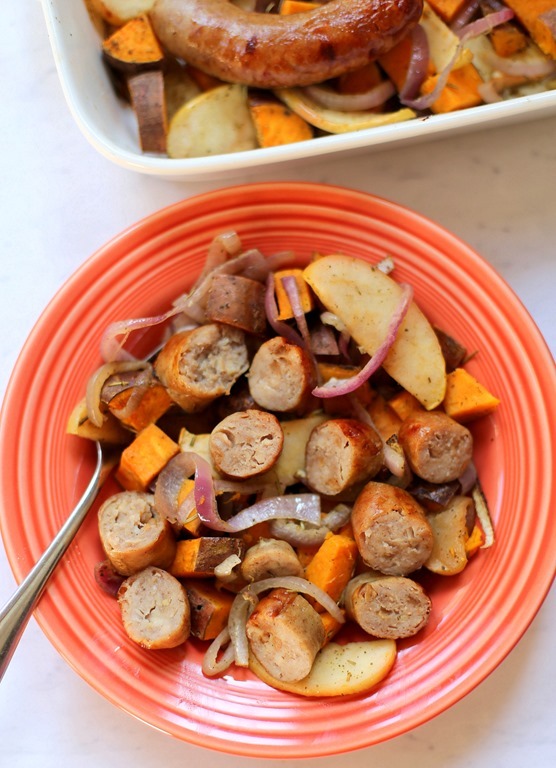 If you’re looking for an easy and nutritious weeknight dinner idea that will come together in a flash and only dirty one dish, this Chicken Sausage Sweet Potato Bake is the perfect recipe! Packed with sweet potatoes, sweet sliced apples and tangy red onion, it’s a dish that will leave you feeling satisfied in a healthy way! Preheat oven to 350 degrees. Spray a large baking dish with cooking spray. 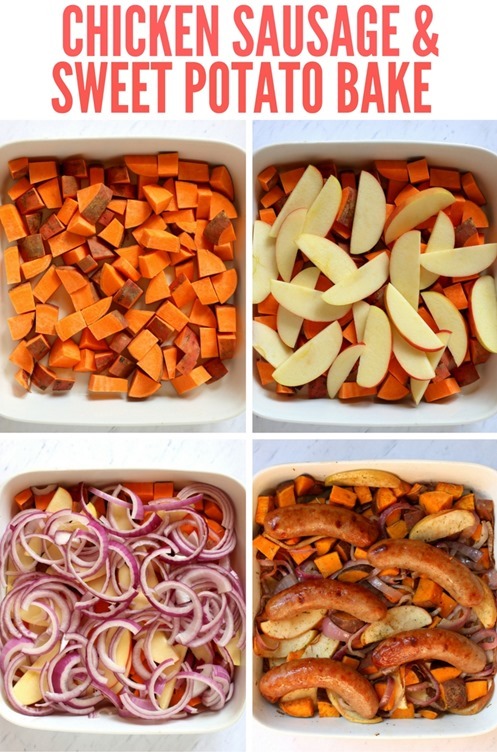 Layer sweet potatoes, apples and onions in the dish. Drizzle with 1 1/2 tablespoons olive oil. Sprinkle with rosemary, sage, thyme, salt and pepper. Toss to coat. Place chicken sausage links on top of the vegetables. Drizzle with remaining olive oil and season with additional salt and pepper. Place in the oven for approximately 50-60 minutes (flipping the chicken sausage and tossing the veggies and apple slices once half-way through cooking), or until chicken sausage is cooked through and sweet potatoes are soft. Pre-cooked chicken sausage may also be used in this recipe, but I recommend adding the chicken sausage on top of the veggies and apples about halfway through cooking to prevent the chicken sausage from over-cooking and the casing becoming too chewy. White or yellow potatoes or butternut squash may also be used in place of the sweet potatoes and sliced peaches taste great in place of the apples as well. What is one of your old school “signature dishes” you remember making all the time when you first lived on your own? Never would have though to add apples! The sweetness would go so well with the spiciness of sausage. Yum! I make roasted chicken sausage (I use Trader Joes’, so many varieties!) and vegetables almost once a week, but never add apples, that sounds yummy! I used to always make chicken and just put franks hot sauce on it and make a buffalo chicken salad. Gosh I have come so far since then, lol. I loveeee chicken sausage and sweet potatoes, it’s such a delicious combo! I’m not going to lie, your buffalo chicken salad still sounds delicious to me! Haha!! This looks delicious!! I’ll be making this this week, haha. My go-to dish was always pasta with a bunch of veggies. I still make that from time to time haha – easy and cheap!! I use daily to always make turkey burgers. That was my go to quick, easy, and cheap meal. This one looks great for a busy weeknight option and my husband would like it too! Hope your day is fabulous, Julie! One of my earliest specialties was called Mushroom Buffet Casserole-basically rice, mushrooms, and cream of mushroom soup and water baked together! I loved making quesadillas out of everything… cheesesteak quesadillas and breakfast quesadillas were two of my faves! I kinda want to bring that back haha. WHY have we not done breakfast quesadillas in forever over here!?! Must make them again! This is a great idea for a quick dinner! You covered two of my favorite foods here! Sweet taters and sausage!!! This looks delicious! This looks delicious. It probably sounds crazy, but I have actually never had chicken sausage before. When I first lived on my own, almost every day between classes at school I would make cheese roll ups – literally just melted Mexican cheese on a tortilla in the microwave. Then when I graduated and had my first apartment, I was addicted to stir fry. I would just throw whatever I had in the fridge in a pan, add some teriyaki sauce, and call it dinner. This looks delicious! Thank you for sharing! Quick Question: Do you typically feed Chase what you make for dinner each night, or do you make him his own special meal? It totally depends! I TRY to feed him what we’re eating but it doesn’t always work so I generally have fallback options on hand (peanut butter sandwiches are always a fav!) Chase actually likes this meal though — mostly the chicken sausage so I paired diced chicken sausage with fresh apples for his dinner when we make this one and he’ll sometimes pick at the sweet potatoes, too. Which brand of chicken sausage do you use? Do you worry about the sodium content? I have a one year old and am always looking for food ideas that will work for him, too. This meal looks so easy and delicious! I can’t wait to try it! When my husband and I first moved in together we ate so much rice and baked chicken. Both are so easy to make and you can add any sauces to switch things up! Yum! This looks delicious. I’m a huge fan of sausage with peppers, so this looks like a great alternative. I’ll be giving this recipe a try next week. Salmon foils! I’d get a pound of salmon cut into 4s, put it in a foil with EVOO, half a lemon, asparagus, rosemary, and thyme. I’d wrap it up and bake it. Easy peasy and minimal clean up. This sounds fantastic!!! I want to do this ASAP! Erin, quick question from a very amateur griller here. 🙂 When you wrap the salmon up and put on the grill, does it still get that yummy grill flavor? I’m hoping the foil lets some of that flavor through but have never tried. Thank you! I needed something easy that’s not my norm. I think I will replace the sausage with tofu to keep it vegan but this looks amazing. How cool to add apples! Welp. This is right up my alley. Excited to make this on a busy weeknight! So weird, I’m making chicken sausage and peppers tonight with pre-cooked sausage and was wondering if it’d get chewy….you answered my question! I used to love making a stirfry with whatever was in the fridge (and honestly still do). If this isn’t fate I don’t know what is! I am defrosting chicken apple sausage as we speak! And I wasn’t %100 sure what I was going to use it for! Also, I “just happen” to have ALL the ingredients for this dish! thanks Julie!!! You’re a dinner saver!! I feel like I would make pizza. Whole wheat crust with veggies. Now if I want something that is easy I usually do chili (in the Winter mostly). It is so easy! or Salsa chicken in the crock pot. Thanks for the inspiration (and the tips about pre-cooked versus cooked sausage). Always love your recipes! One of my old school “recipes” is just an old lady lunch lol – I eat cottage cheese as a savory dish. Cottage cheese, salt and pepper, and cut up cherry tomatoes with salt and pepper on it. Yum! I cooked alongside my mom sometimes growing up, and more when I got older, so a lot of her recipes were my first recipes when I lived on my own! Like bone-in pork chops with cream of mushroom soup and other ingredients that I can’t remember. So good! I love the pictures of the layers of ingredients! Thank you for such a great recipe! Thank you so much for this recipe! I made it tonight and it was delicious, but took way longer than 1 hour to cook. Wondering what I did wrong??? Did you cover it with tinfoil first? This looks so yummy, I love sweet and savory combos! Thanks for sharing! I made this last night.. it was SO good!! Will definitely become a staple in our household. I am so, so glad to hear it! Thanks so much for taking the time to comment and let me know! Just made this and we both really loved it! I thought my dh might snicker at chicken sausage but he loved it. Thanks so much for the recipe. I used al fresco red pepper and asiago chicken sausage and some store made italian style chicken sausages – really awesome. As far as meals I made when I first left home – first thing that comes to mind is Kraft Macaroni and Cheese – does that count!?? LOL I think another real meal I made was American Chop Suey… I literally couldn’t boil water when I went to college but I quickly learned how to become a very good cook – because my boyfriend/now husband and myself really LIKE GOOD FOOD. So glad you liked the recipe! Thank you for letting me know! I made this for dinner tonight and I’m already excited to have the leftovers for lunch tomorrow! So good! This looks delicious! Do you leave the skin on the sweet potatoes? Yes! It’s definitely a preference thing but I love the skin! Thanks for posting. I LOVED this recipe! Followed everything you said with the pre-cooked sausage modification, and it came out great! Looks great!! Do you think I can prep it, then freeze? Maybe bake the day of? I made this and my entire family loved it! I used butternut squash and added a peach in place of one of the apples. Also, I sliced the sausage (the pre-cooked kind) and added it in the middle of the cooking time. So yummy! Thanks for a great recipe and for giving substitution options at the end! We really enjoyed this. I cut it in half for my husband and me. We were in a bit of a hurry so I bumped the oven temp up to 400 degrees about 20 minutes into the cook time to shorten it. I had no sage but did have a Rosemary and lemon herb blend that I bought through one of those home parties. I was worried it might be a bit overwhelming, but it was delish. I also cut up the sausage into little coin shapes. It got good reviews and I served it with fresh green beans cooked about 4 minutes in the microwave. We’re at one hour twenty minutes and potatoes still hard. Upped temp to 400, added 1/2 cup broth and covered with foilHoping to have dinner in the next half hour.